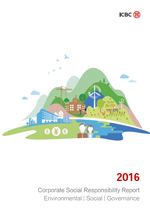 ICBC released 2016 Corporate Social Responsibility (ESG) Report (“the Report”) on 30 March 2017. This is the 10th consecutive year the Bank published such report since 2007. KPMG Huazhen LLP performed assurance procedures on the Report.